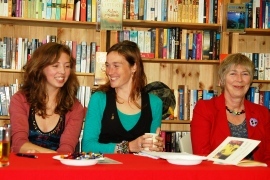 Surely few venues involved in Wordfringe can match the intimate atmosphere of Better Read Books in Ellon, and it was in this unique environment, surrounded by the very words that all poets attempt to capture, tame and fold to their will, that we met a trio of superb female voices, Paulina Vanderbilt, Maureen Ross and Bryony Harrower. With a perfect blend of their own poetry, Maureen and Bryony provided the very best support to Paulina, who was launching her new Koo Press chapbook, entitled In Search of Salt. Through the medium of her words Paulina captivated the assembled fringers with her warmth and enthusiasm for life, love (especially the love of her family) and relationships. Journeying from her home in Holland (where she lives) via Aberdeen (which she calls home), Paulina eloquently and engagingly read a selection of her emotionally charged poems to the appreciative gathering, her back stories helping us to get a deeper sense of each piece. After a welcome break for refreshments, and a brief but lively open mic session, Paulina returned to round off the evening with a further taster from her book, which, judging by the queue to get signed copies afterwards, a lot of people had enjoyed the taste of and intended to search for even more of this delightful poet's work.